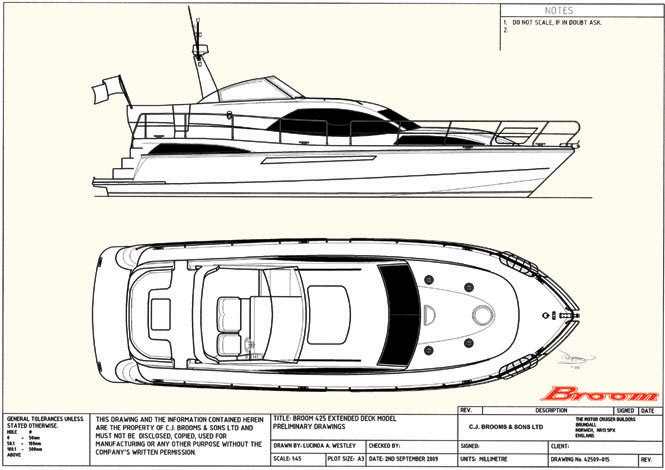 Broom has introduced the latest addition to their range of luxury cruising motor yachts, the Broom 425 aft cabin. The design incorporates many new features that have been recently developed across the range, plus new ideas created by Naval architect, Andrew Wolstenholme and our in-house design team headed up by Lucinda Westley. 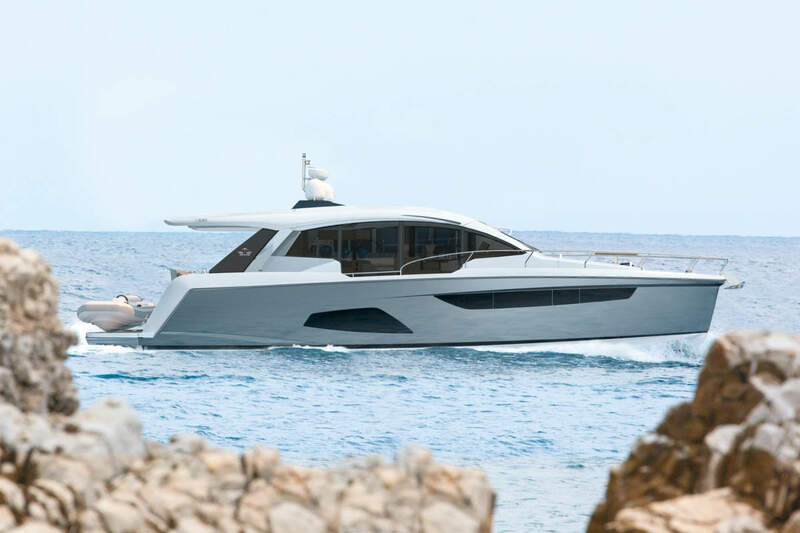 The exterior has our latest concept in styling and incorporates steps both sides of the transom which have proved to be so successful on the Broom 450 and Broom 365. The design makes use of frameless windows and the latest techniques of bonding the windows to the superstructure. The interior provides for a really superior guest cabin with a large shower and toilet compartment. The berth can be easily converted from twins to a double. 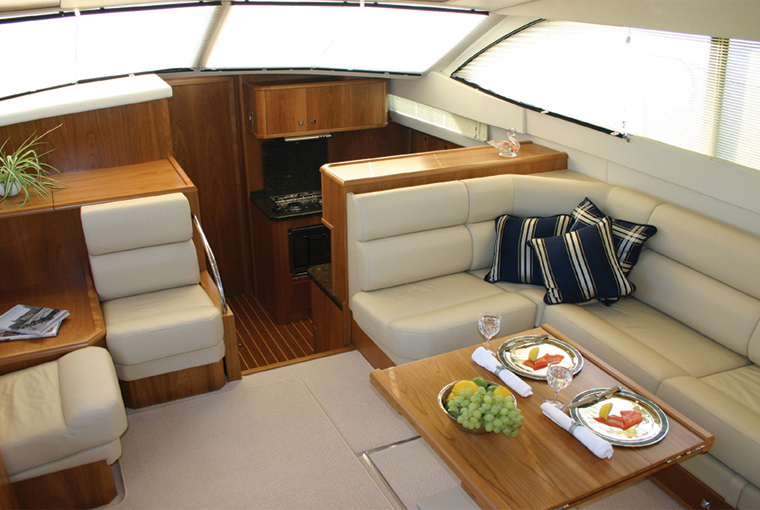 The spacious deck/ saloon has corner seating and a table to port side with chairs being made portable to provide two comfortable dining seats at the main table. 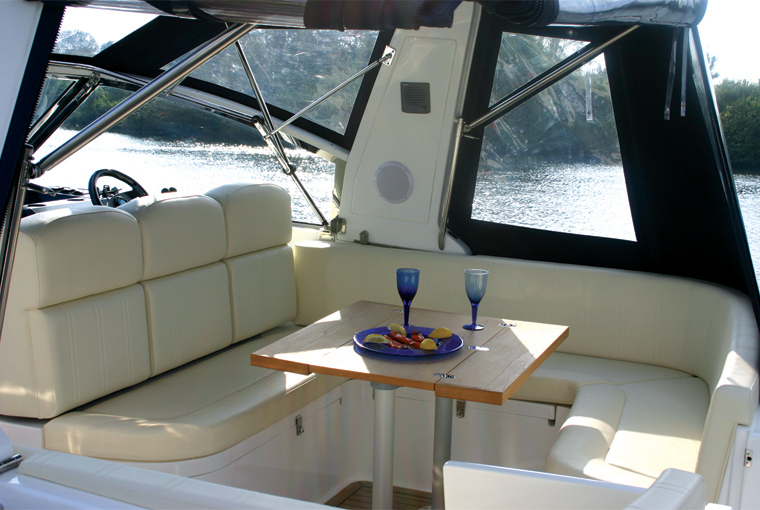 Alternatively owners can choose the dinette layout, which incorporates an additional seating area adjacent to and on the same level as the galley. The mouldings are of excellent quality and are produced using hand laid chopped strand mat and woven rovings in Lloyds approved isopthalic gel coat and resin, over double brushed isopthalic gel coat all but eliminating the risk of osmosis. Substantial transverse and longitudinal stringers are Incorporated throughout the hull for strength. The hull and deck joint is both riveted and bonded. The layout provides an easy to use boat when either passing through locks, low bridges or just mooring up, yet also provides comfort and safety when cruising offshore. A major feature of the 425 is the easy and safe access from both sides of the transom with more than adequate safety rails and handholds. The large aft deck area has a door at the aft end for added security. There is also a large dinette seating area with table for outside dining. Teak type decking on the bathing platform and deck steps is provided as standard, together with a boarding ladder. 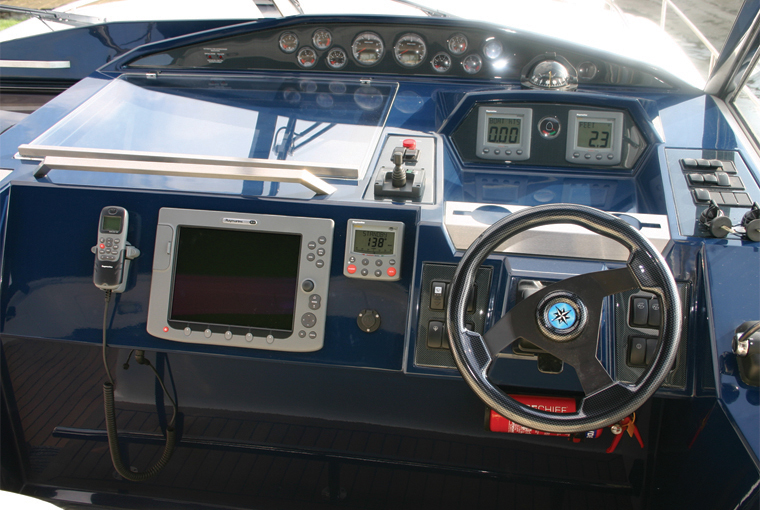 Ergonomically well laid out, the console design permits ease of monitoring the engine systems and navigation equipment, together with an excellent view. Weather protection is provided by the large windscreen. A two part hood protects the cockpit area and helmstation. 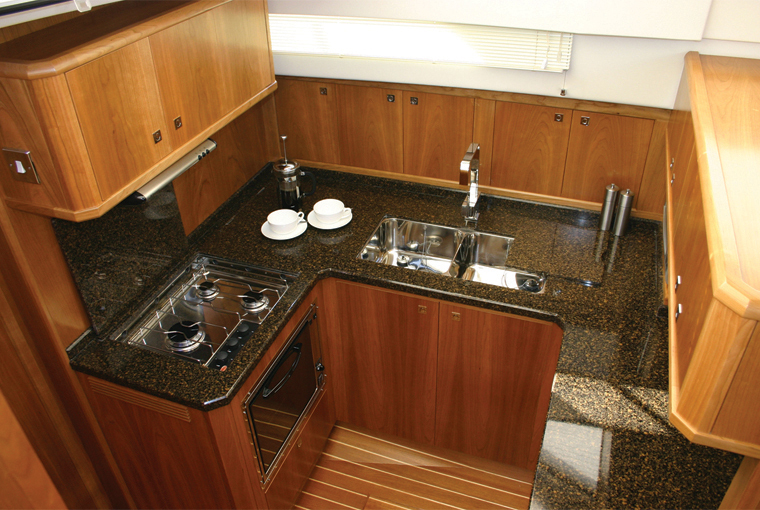 The galley is an easy to use work area complete with stainless steel sink unit with hot and cold water mixer tap. Three burner hob unit with extractor fan, oven and grill. Electric refrigerator. Crockery stowage and cupboards. Cutlery drawer. Easy clean work surfaces. 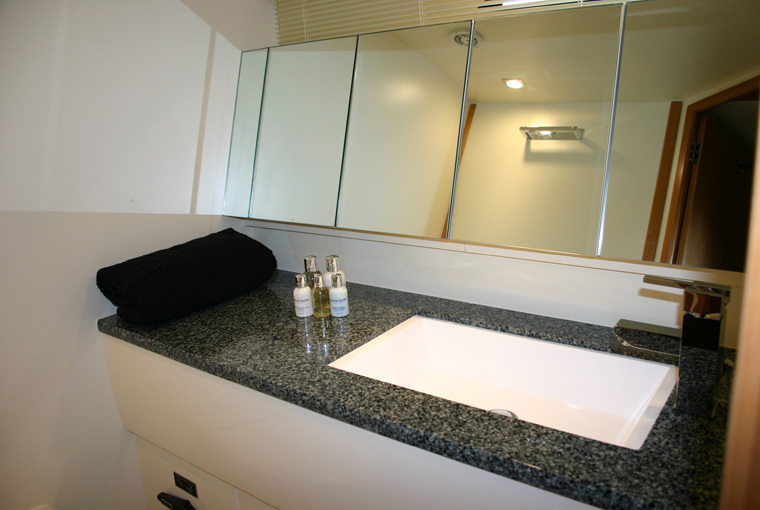 A washer/ dryer is provided as standard in the galley hallway which is directly opposite the galley. Storage cupboards are provided above the washer/ dryer and a drawer below. On the dinette version, the washer/ dryer is located in the aft hallway. 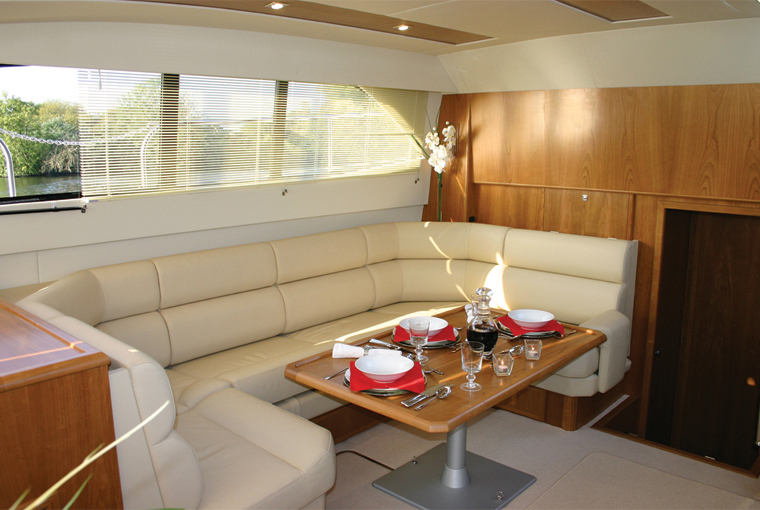 The spacious saloon has corner seating and a table to portside with chairs being made portable to provide two comfortable dining seats at the main table. Opposite the settee is an attractive sideboard with cabinets, and provision for a T.V. Opening windows are provided in the saloon. 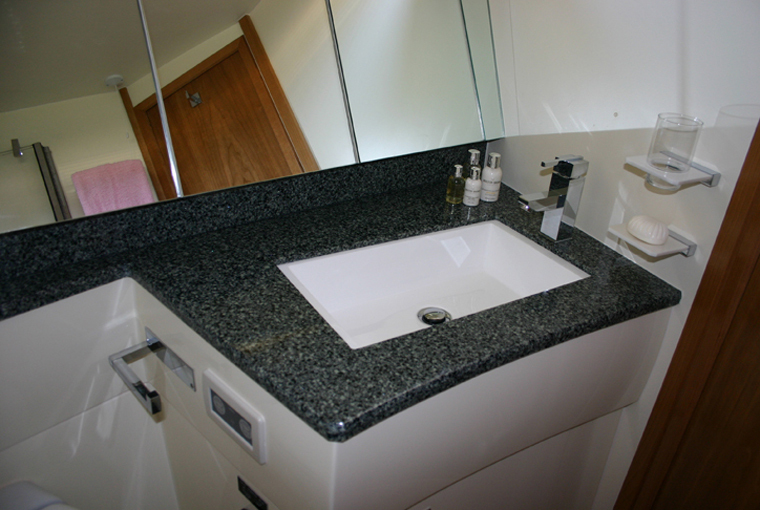 The choice of materials is very flexible to meet owner requirements. Externally, vinyl covering is standard material in a single colour with piping. Internally the owner is free to choose from the range of materials offered by our interior designers. The forward guest cabin in the 425 is really superior with a large shower and toilet compartment. The berth can easily be converted from twins to a double (please note double berth illustrated in photograph). Roof and individual reading lights. Escape/ ventilation hatch in roof. 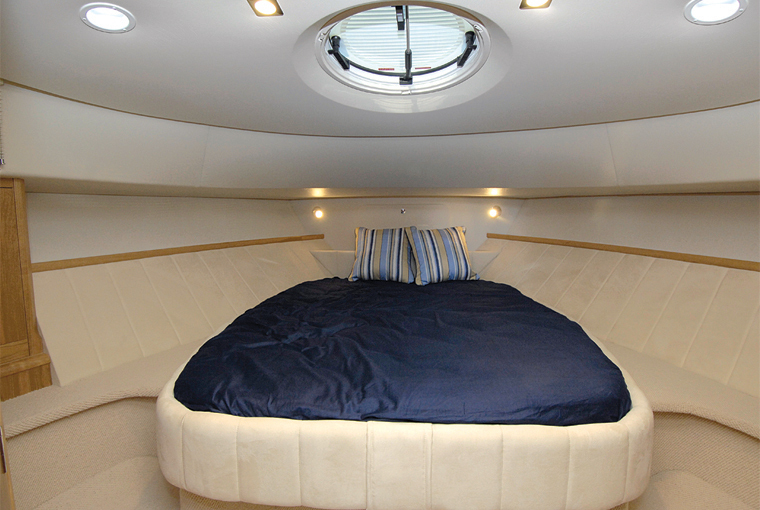 The aft cabin is a unique feature of the Broom range, and the 425 is no exception. 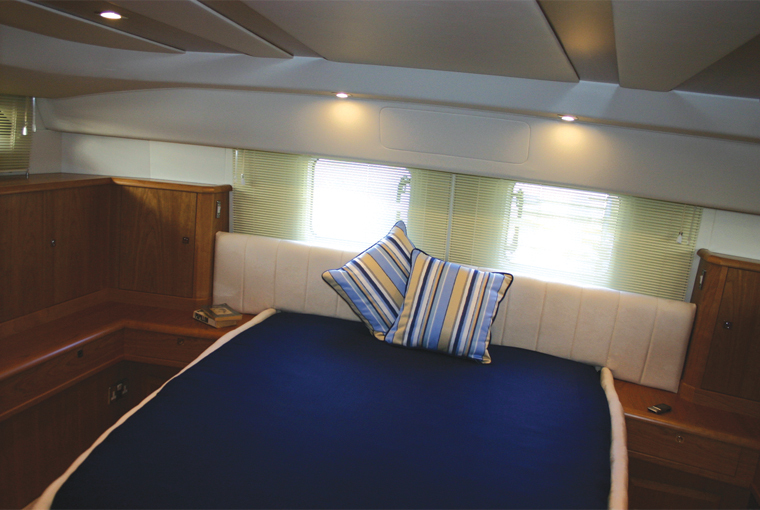 There is a large double berth, spacious wardrobes, ample drawer space and full headroom. Transom mounted windows give plently of light and also provide a means for escape. Opening windows. 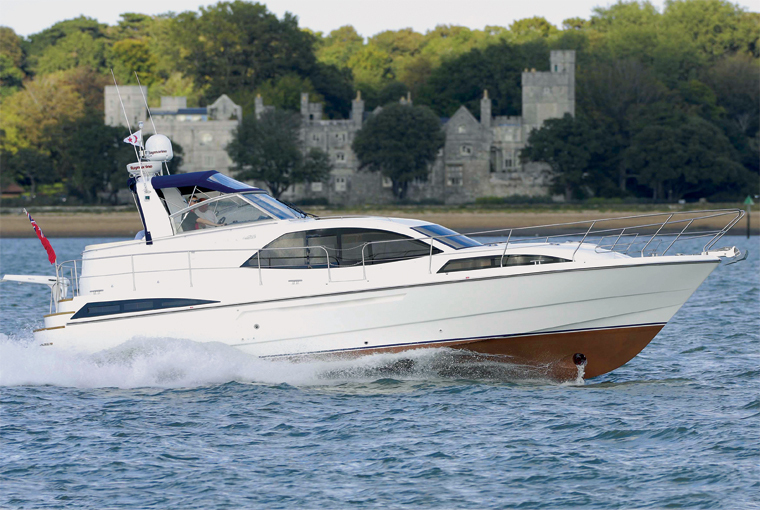 The 425 is available with a single or double diesel installation giving speeds between 18 – 25 knots perfect for cruising in comfort over long distances. 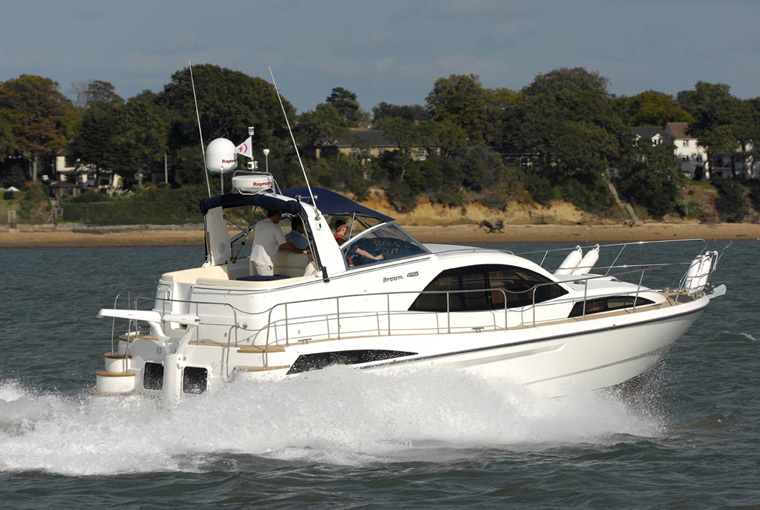 The Broom range has been steadily growing, the addition of the 425 aft cabin is a good fit between the 395 and 450, providing Broom with a competitive line up in the under 55ft market. I have been a broom fan for many years and its great to see them producing new models of the aft cabin. I was impressed with their line up at London Boat Show this year and it seems the compnay is heading in the right direction too!